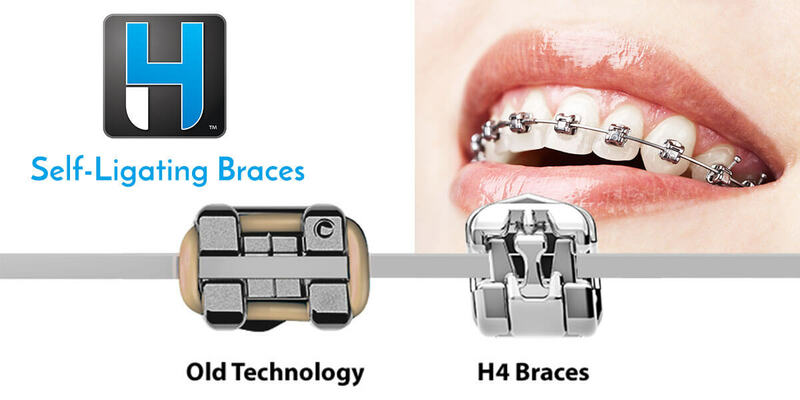 H4® Braces utilizes self-ligating brackets have provide many advantages over traditional metal brackets. The primary difference between H4® Braces and traditional braces is that they do not use elastics or metal ties to connect the arch wire to the brackets. H4® braces provide your orthodontist with alternate options to move your child’s teeth, including fewer extractions. H4® Braces may appear smaller than traditional brackets. The absence of elastics and ties can make oral hygiene during orthodontic treatment easier and more effective, although special care and attention to daily cleaning is important with any type of orthodontic treatment. Adjustment appointments are often shorter with H4® Braces because of the specialized brackets that hold the arch wire within the bracket. Overall treatment time with H4® orthodontic brackets is often shorter than that of traditional metal braces.